When I see a trend that I wanna rock, I turn to SheIn. There are a ton of items in my Fall wishlist, but here are a few that I wanted to share with you. 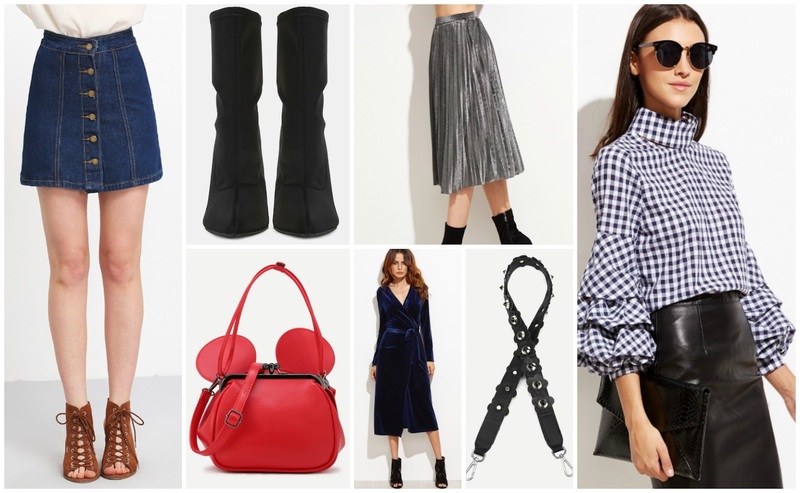 The bag looks just like one that Coach created with a Mickey Mouse theme, the bag strap looks just like the ones from Rebecca Minkoff's latest collection and you need some velvet for the cooler months. Cuando veo una tendencia que llevar, voy a SheIn. Hay un montón de prendas en mi lista de deseos para el otoño, y aquí os quiero mostrar algunas. El bolso es como uno que creó Coach con el tema de Mickey Mouse, la correa de bolso como los que vi en la última colección de Rebecca Minkoff y el terciopelo es necesario para los meses más fríos. EN As simple as this button front skirt is, I LOVE it! It's a great piece to mix and match this season. But do be careful with sizing. I ordered it in a Medium and it was more like an XS. It'll look just as good with tights as it does barelegged with booties. I'm crushing hard on mock neck tops and here are three that are on my radar...and would also pair well with this skirt. I would wear the striped one with a pair of sneakers, the gingham one with some midi booties and the sheer one with some edgy lace-up ballerina flats. ES La falda vaquera es sencilla, ¡pero me ENCANTA! Es una pieza genial para combinar con todo tipo de top. Pero ten mucho cuidado con las tallas. Ordené la M y era más como XS. Se puede llevar igual de bien con leotardos que con las piernas desnudas y unos botines. Tops de cuello monje me chiflan y estos tres quedarían chulísimo con esta falda. Llevaría la camisa de rayas con unas deportivas, la blusa con estampado vichy con unos botines midi y el top transparente con unas bailarinas atrevidas. Amor total por las blusas!!! Sin duda quedan genial con la falda y ese bolso tan divertido!! I am loving these fall faves from she in, they have amazing things and would love lo get them all! Right?! I'm with you girl! They've got tons of cute clothes and I want them ALL!!! Thanks boo! That checked top with rouched sleeves is my favorite too! Necesito una falda así pero de cuero y con cremallera.....! !